Introducing the New Polishing Tooth Powder! 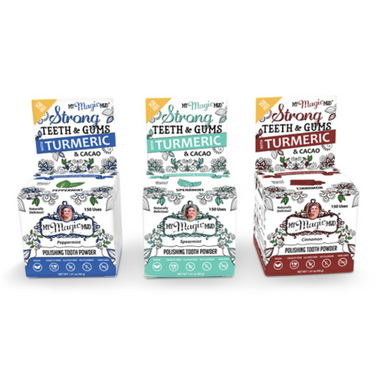 From the Global Best-Selling Oral Care Brand, comes a new line of Polishing Tooth Powders featuring organic turmeric, cold pressed cacao, and non-gmo xylitol, in 3 delicious flavors: Peppermint, Spearmint, and Cinnamon Clove. What is turmeric and cacao tooth powder? My Magic Mud® Turmeric & Cacao Tooth Powder for Polishing is a natural oral care remedy that cleans, polishes, and whitens your teeth. It features certified organic turmeric, certified organic cacao, and bentonite clay and is available in three delicious flavors: Spearmint, Peppermint, and Cinnamon Clove. 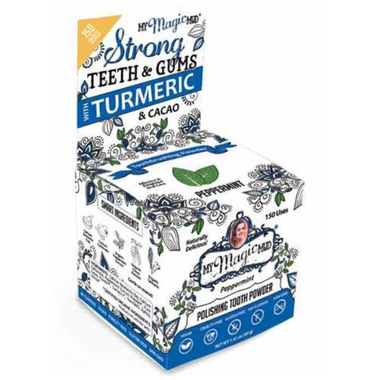 My Magic Mud’s new oral care collection was inspired by published studies demonstrating the benefits of these natural ingredients for optimizing oral health. Our new “white label” tooth powder is a complement to our "black label" activated charcoal oral care collection, for those who would like to try something new and cutting edge.